Poised on an elevated plateau that meets with limestone cliffs sweeping down to the ocean, the view from the Alila Villas Uluwatu is nothing less than picture perfect. Rediscover the joy of pure relaxation in unparalleled comfort and space in each of our exquisitely designed Bali luxury villas. 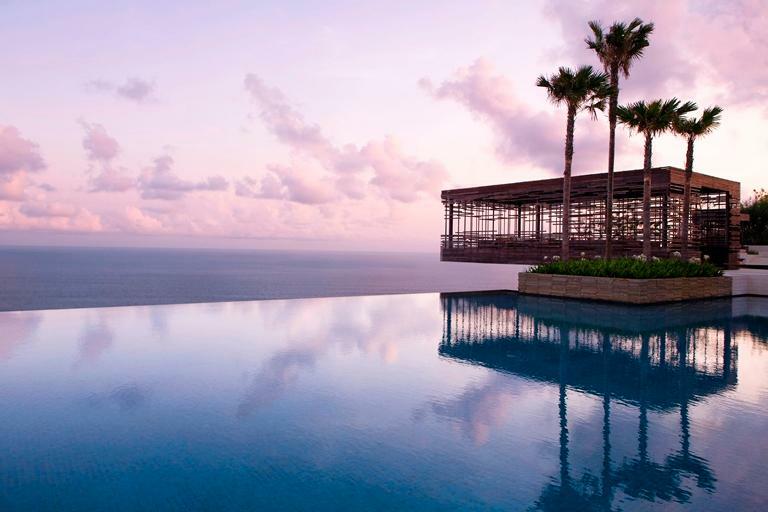 Surrender yourself to the enchantment of Bali's beauty and serenity in the luxury of flawless perfection. Located on a clifftop plateau along the southern coastline on the island's Bukit Peninsula, Alila Villas Uluwatu in Bali, Indonesia is just 30 minutes from Ngurah Rai International Airport and 15 minutes from Jimbaran Bay near the renowned Uluwatu Temple. Surrounded by breathtaking coastal vistas, where the ocean stretches out as far as the eye can see, merging with the sky in a seemingly unending horizon, our luxury Uluwatu villas offer the perfect escape on this island paradise. Each individual villa is specifically designed and constructed to follow an environmentally sustainable framework, with its own pool and private cabana overlooking the Indian Ocean. The 65 villas showcase contemporary interiors enhanced with touches of nature and traditional Balinese accents reflected in planes of wood, water, stone and rattan. Walkways and bridges connect the relaxation pavilions and pools to the spacious living areas. The open plan design, unique flat lava rocks roof and bamboo ceiling allow the gentle sea breeze to circulate throughout all rooms of the villas. Guest enable to personalize their stay online prior their arrival, this include: Pillow menu, bar menu, arrival & departure immigration assistance, reading options, etc. Private: To respect your privacy, host services will be delivered upon request. Discreet: Standard host services will be delivered meanwhile your privacy will be prioritized at all times. Indulgent: 24 hour personalized butler services to deliver your every whim. Oversized LED TV with satellite channels, DVD player, telephone and WIFI connections, safety deposit box, Espresso coffee machine and tea making facilities, private bar, private pool, outdoor dining, private cabana. Deluxe bathroom equipped with indoor and outdoor rain shower & jet shower, bathtub, luxurious linen by Ploh: thick towels, yukata, 300 thread count bedsheet and duvet. Completed range of superior quality locally-sourced organic ingredients are included in Alila bathroom amenities specially made for HIM (lemon grass and black pepper) and HER (mandarin, lemon grass and rose geranium). Special bathtub box, containing everything from bubble bath to face masks and beautiful handcrafted beeswax candles; all in Alila’s signature secret scent and set of outdoor activities amenities including: sun block, cooling gel, mosquitoes repellent and face spritzer. One bedroom pool villas are specifically designed and constructed to follow an environmentally sustainable framework. These Bali Villas with private pool and cabana looking out towards the Indian Ocean, feature contemporary interiors enhanced with touches of nature and traditional Balinese accents – reflected in planes of wood, water, stone and rafan walkways and bridges connect the relaxation pavilions and pools to the spacious living areas. The open-­plan design, unique flat lava rock roof and bamboo ceiling allow the gentle sea breeze to circulate throughout all areas of the villa. Each three-­bedroom villa is located on the hillside along the southern coast of Bali. Specifically designed and constructed to follow an environmentally sustainable framework, our three bedroom villa elegantly blend contemporary interiors with touches of nature and traditional Balinese accents, reflected in planes of wood, water, stone and rafan. Walkways and bridges connect the relaxation pavilions and pools to the spacious living area in a beautiful open-­‐plan design, while unique flat lava rock roofs and bamboo ceilings allow the gentle sea breeze to circulate freely throughout all rooms. Each two ­bedroom villa is located on the hillside along the southern coast of Bali. Specifically designed and constructed to follow an environmentally sustainable framework, our two bedroom villa elegantly blend contemporary interiors with touches of nature and traditional Balinese accents, reflected in planes of wood, water, stone and rafan. Walkways and bridges connect the relaxation pavilions and pools to the spacious living area in a beautiful open plan design, while unique flat lava rock roofs and bamboo ceilings allow the gentle sea breeze to circulate freely throughout all rooms. An exceptional choice for luxurious Bali family villa accommodation. Cire presents menu that marries East Asian flavors and ingredients with western cooking techniques. Cire also offers a refreshed dining experience that celebrate the love of Asian for sharing good food. Dishes are presented in such a way that, although served individually, the can be easily shared. Pronounced “Seer”, Cire refers to a process of waxing or polishing, paying tribute to the Indonesian back stamps which decorate the restaurant’s wine room. Open for all day dining. 7.00 am – 11.00 pm. The Warung presents wholesome traditional Indonesian and Balinese fare. Indoor and outdoor dining is provided in this welcoming yet sophisticated space. The friendly and convivial atmosphere enables diners to have a casual, laid back experience, whether they choose to interact with other guests at the communal tables or opt for the more private tables for two. Open from 11.00 am – 11.00 pm. Located on a clifftop plateau along the southern coastline on the island's Bukit Peninsula, Alila Villas Uluwatu in Bali, Indonesia is just 30 minutes from Ngurah Rai International Airport and 15 minutes from Jimbaran Bay near the renowned Uluwatu Temple.